Weblink.In Pvt. Ltd., formerly known as WeblinkIndia.Net Pvt. 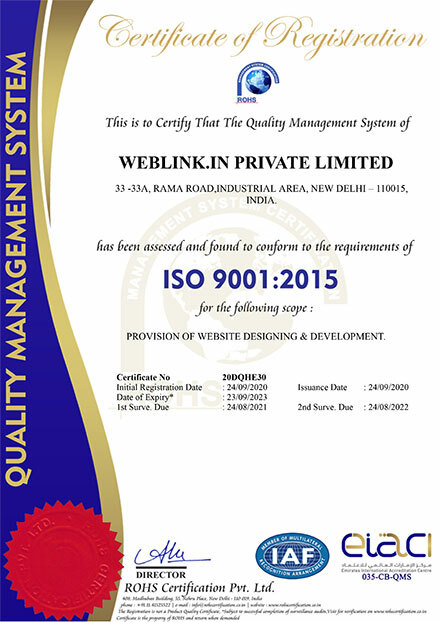 Ltd., is an ISO 9001:2015 certified organization, offering growth solution to businesses across all verticals like Business-to-Business (B2B), Recruitment, Matrimonial, Real Estate, Travel & Tourism and Web Design & Development. We discover, define, design and deliver business solutions that synchronize well with fundamental requirements of respective trades to fulfill our promise of continuous business growth. A group of passionate professionals laid the foundation stone of Weblink in 1997. Ever since, we have been moving ahead with a quality-driven approach and have assisted thousands of enterprises in scaling their business. Continual development in terms of infrastructure, skill-set, technology, and services has enabled us to keep moving forward and achieve unparalleled results for our clients. Our keen eye on emerging trends of online business as well as technical spheres has empowered us to offer the most innovative business growth solutions. Our business ventures include ExportersIndia.Com, RealEstateIndia.Com, PlacementIndia.Com, TourTravelWorld.Com, MatrimonialsIndia.Com, and WeblinkIndia.Net. With these ventures, we are serving the interest and purposes of global commercialists and individuals. In addition to this, our expertise in all business verticals and eye for detail have not only achieved 100% satisfaction of our clients but also raised their bar of expectations. Our commitment of words is always converted in the excellence of work, with which we are enjoying long-term global business bonds. Vision : To sow the seeds of par-excellence services with a customer-centric approach and reap the trust of worldwide clients. Mission : Our mission is to touch the horizon where our capabilities may successfully meet with requirements of our clients, that too with ultimate transparency and cost-effectiveness. Transpicuous Work Culture : Our words and actions always go hand-in-hand. We strongly preserve transparency to be correct ethically, legally and socially as well. Result-Orientation : By setting clear goals, fixing the priorities, organizing the resources and rigorously monitoring the growth of the project. Customer-Centric Approach : We revere the uniqueness of each client & his requirements and budget thus shape out the mirror-like solutions. Innovation : Think and do out of the box by setting the minds free. We also seek the unrevealed possibilities, hidden in feedbacks and suggestions of clients and co-workers. Quality-Driven Approach : To build long-lasting relationships with our clients, we never settle for anything less than the best in terms of quality.